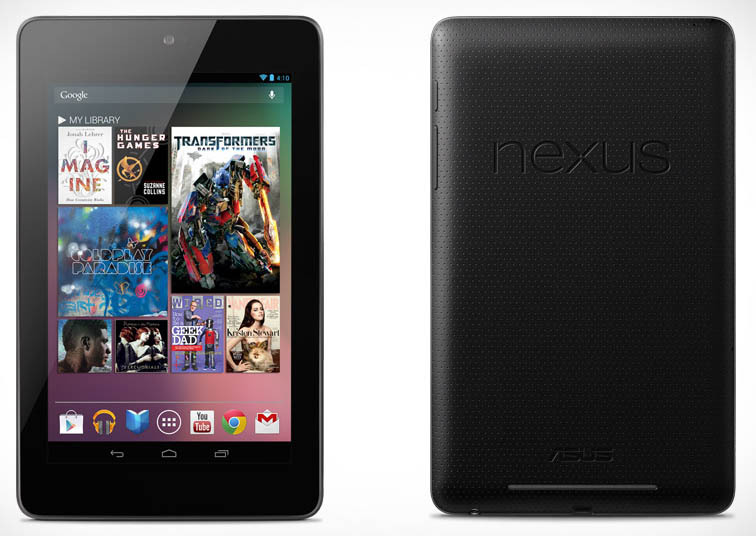 The Google Nexus 7, manufactured by Asus, is the first tablet in the affordable Nexus range of devices. Originally released in July 2012, it took a while to get to Indian shores, but it’s finally available to purchase. Disappointingly though, one of the biggest pros of the device, the low price, can’t be considered here because of some truly bad Indian pricing. Nevertheless, as a device, it’s sure to impress. So how does Google’s first tablet fare? Is it worth your hard earned money? Read our Google Nexus 7 review for the full breakdown! Unlike any tablets in this range, or even higher for that matter, the Nexus 7 features a quad core processor and internals that are very similar to the powerful HTC One X. The downside here, is that there’s no expandable storage and you’ll have to make do with either 16 GB or 32 GB. There’s also no rear facing camera, but who really takes photos with tablets anyway? The 7 inch screen takes up most of the real estate on the front and there’s a pretty thick bezel on the top and bottom when held in portrait mode. When in landscape mode it’s convenient to hold though. The screen is covered with Corning Glass, so you don’t have to worry about scratches all that much. The best part is the build quality, Asus have really outdone themselves and the Google Nexus 7 feels absolutely amazing in hand. It doesn’t give you the impression of a “budget” tablet and the soft rubber back is fantastic to hold. I actually prefer this sort of back instead of a glossy one, it’s far easier to hold and maintain. There’s just 3 buttons on the side, a power button and 2 volume buttons. There’s a 3.5 mm audio jack and MicroUSB 2.0 port on the downside as well. The speaker is a strip at the bottom of the device. The build quality is top notch, overall. Design is simple and minimalistic, which we like! The LCD IPS screen does a fairly good job, but videophiles might notice the slightly muted colors and lower contrasts. This is partly due to the fact that traditionally AMOLED screens have deeper blacks and better contrasts. In sunlight the Google Nexus 7 screen gets difficult to see, but it’s not a deal breaker as such. The good part is it’s a pretty dense screen and the resolution is very good. Pixel density is 216 ppi, which is more than the iPad Mini, in case you were wondering. Text is sharp and crisp, and games look fantastic. For most users the main thing they will notice is that the screen is not as bright as others, and that’s just about it. Overall the screen is pretty good. Since it’s a Nexus device, rest assured you will get the latest and greatest Android updates first. While the tablet comes with Android 4.1 Jelly Bean out of the box, as soon as I powered it up and connected it to WiFi there was an update available to upgrade it to Android 4.2, also called Jelly Bean. Android 4.2 brings with it a lot of new features, the most noticeable of which are lock screen widgets, the new notification/status bar and an included Swype like keyboard input option. Since “Project Butter” is included, the interface is smooth and responsive, and with the powerful hardware inside, you won’t notice any lag at all. As mentioned above, the Nexus 7 comes with an Nvidia Tegra 3 SoC, and a lot of apps are actually optimized for this device. So there’s a few games with the suffix “THD” that run with better graphics on the Nexus 7. This is good news for gamers, as there are some pretty awesome games for Android including ports of Max Payne and Grand Theft Auto III that run great. The 7 inch screen real estate also makes for some pretty comfortable gaming. Other apps also run well, although like most Android tablets you might face slight problems if they’re not tablet screen optimized. 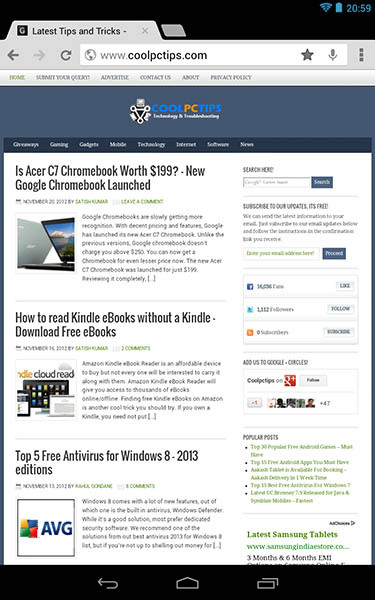 For the few that are optimized for tablets, you won’t find any problems at all. WiFi connectivity was top notch as well and I didn’t face any problems connecting it to multiple home networks. Connection takes less than 4 seconds so once you’re in range you can browse the internet in no time. Google Chrome is built in as the default browser here and if you use it on desktop as well, you can sync all your bookmarks, settings and addons to the Nexus 7 as well. Again, the 7 inch screen makes web browsing pretty easy in both portrait and landscape mode, and if you really need to zoom, there’s always the pinch to zoom feature. With the powerful hardware underneath, battery life could have been its Achilles Heel. But Asus went and crammed in a pretty huge 4325 mAh battery that puts battery life somewhere around the 6-7 hour mark with continued usage. It’s an impressive number and you can expect around 4-5 hours even with heavy gaming. There’s not much by way of extras in the box, all you’ll find is an adapter and USB cable. In conclusion, the Google Nexus 7 is a great tablet that offers some serious bang for your buck. With Google backing it, we’re sure to even get the latest updates for quite some time and for people who want an unadulterated Android experience, this is a boon. 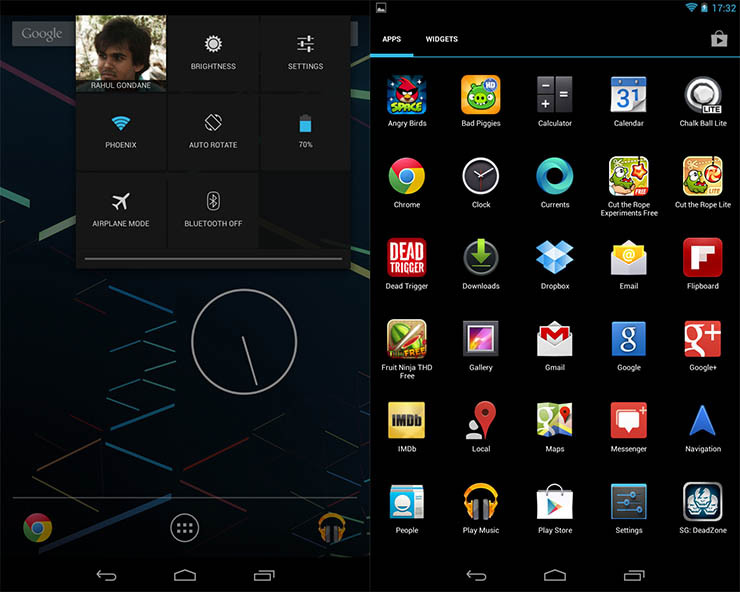 Because unlike other devices, the Nexus line comes with pure Android devoid of custom UI’s. There’s powerful hardware to back it up too, and you can’t really go wrong. Even better is the 199$ price tag which makes it a no brainer. Unfortunately, this tablet is priced at Rs. 19,999, which suddenly makes it lose that awesome value for money it had going for it. But if you’ve got the money and love Android, this is the tablet for you! Do let us know what you thought of our Google Nexus 7 review and as always, queries are welcome too. Wow so good & brilliant review, i like it. Yes, but then again that price applies only in the United States, in India the Nexus 10 hasn’t been released and will probably be priced much higher if it does release. Perhaps we will compare these devices soon, keep watching this space! I think you’re very confused. The price has been set in India at 20,000 officially and we can’t do anything about it. It might be Indian taxes and such. What has jailbreaking got to do anything with it? What is the price in US for 16GB and 32GB ? 199$ for 16 GB and 249$ for 32 GB. Great features. Thinking to change my phone to buy S3 phone. Which is better bro ? S3 or Nexus ? Well the Nexus 7 isn’t a phone, it can’t make calls, you can’t really replace your phone with it. Very nice & useful review, i like your efforts. thanks to sharing good update.